13-Nov-2015 -- While en route to Australia and New Zealand (which I visit each year during the Southern Hemisphere Summer), I decided to spend a few days in the French territory of New Caledonia - a place that I had yet to visit (despite being the closest major landmass to my home country of New Zealand). My reason for visiting New Caledonia was two-fold. First, I had already brushed up on my high school ‘tourist French’ for my visit to France earlier in the year, so I decided to ‘strike while the iron was hot’ and visit another French-speaking country while the French language was still somewhat fresh in my mind. The second reason, of course, was that New Caledonia has a Degree Confluence Point - one that appeared to be quite easy to visit. After spending a few days in the capital of Nouméa, I rented a car and drove northwards. Rather than heading directly for the Degree Confluence Point on my first day, I instead stopped for the night in the small town of Poindimié, on the island’s north-east coast. The next morning, I continued northwards along the coast to the beautiful Hienghene area, then backtracked to take the Tiwaka->Koné road to cross back to the western side of the island. This road passes just 400m south of the Degree Confluence Point. (There's a side road nearby that comes even closer, but taking that route would involve passing a farm house.) Instead, I parked beside the Tiwaka->Koné road, and hiked from there. After returning to my rental car, I continued westward to the town of Koné, then continued southwards back to Nouméa. The driving on this trip took several hours. New Caledonia’s main island is remarkably long. Nonetheless, New Caledonia is definitely worth a visit - whether or not you decide to visit its Degree Confluence Point. #9: View West (from 20m east of the point, outside the bamboo patch). 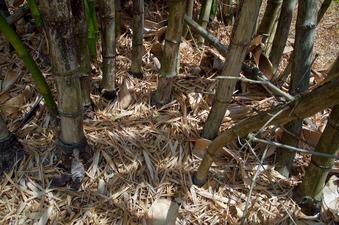 The confluence point lies within the bamboo in the lower-right of the photo.